Happy June Everybody! Today I'm sharing my current beauty wish list! I'm almost out of my Urban Decay Naked Liquid Foundation. Love it, but I want to try something new. I've had my eye on (2) Yves Saint Laurent's Le Teint Touche Eclat Liquid Foundation for awhile. I plan on going to Sephora, so they can match my skin tone to the correct shade. If the YSL foundation doesn't work out, I may try MAC. I just recently saw an impressive review by a beauty blogger for (1) MAC's Select Cover Up. I've been stuck like Chuck on Benefit's Boi-ing Concealer, but this MAC concealer looks even better. I haven't seen one bad review for (3) Philosophy's Fresh Cream body lotion. It's so popular, there's now a body wash to compliment the lotion. It's suppose to smell confectionery sweet :) Speaking of sweet, I've got to test out (4) Viktor & Rolf's Bon Bon Collection. I could order it online, but I really want to go to Saks Fifth Avenue and try it before I buy it. This collection is not cheap! So that's another good reason to test it out at the store. LOL I also want the shower gel and body wash. Word around the beauty-sphere is, it will eventually be sold at Sephora. That would be nice! Have you heard of the brand Lipstick Queen? I learned about them last month. They have just introduced a lipstick called (5) Let Them Eat Cake! It's only sold at Barney's (this particular shade). It seems to be a beautiful color. I really want it just for the name. So it's not a priority. Plus it's $45. Definitely not a priority! LOL (6) Schwing! by The Balm. What can I say? I saw a blogger review this. The tip of this eyeliner looks so amazing. You can draw the thinnest to the thickest lines with this eyeliner. Before the end of June, I will pick up (7) Chanel's Tutti Frutti and Mirabella nail lacquer. The swatches for these are gorgeous. They are great Summer colors. I included the (8) Too Faced Melted long wear liquified lipstick, but I'm on the fence about this. The colors look REALLY different on different skin tones (check the swatches on their website) and I'm not into a lot of shine on my lips. However, doesn't the name make you think of a hot fudge sundae? HaHaHa Ok, that's just me. LOL And finally, I've never tried (9) Paul and Joe Beaute products. They've just introduced an Ice Cream Parlour Collection! I know!!! Lip glosses (that you can taste) and cheek color. You can purchase these (orange sorbet and orange pineapple) from ASOS. This is NOT a sponsored post! I get nothing if you click on these links (I just provided them for you). These are just merely products that are on my wish list, that I wanted to share with you (like always). If I purchase any of these, I'll definitely post reviews for you (as always). Have A Great Day! I absolute can have all of your pretty wish listed. I'm thinking to get that YSL too. Enjoy the rest of your week:). So cheerful, perfect for summer! I only have one Chanel polish, my bestie got it for me, it's a pretty pastel pink, but very sheer so it needs a few coats. Great wishlist. I don't really wear anything on my face on a daily basis, except lip gloss maybe. I do wear them on occasions and when I get a zit, a concealer would be nice. Maybe I can try that MAC you mentioned. I want what's on your list too! I've never tried that MAC concealer, and you're right....I've only seen great reviews on it. I will want this wishlist is nothing there I will not want. I can see why you have put these lovely products on your wish list as it's good to have a change now summer is here. I can't get enough of corals at this time of year and your nail polishes are great choices. I'm on the look-out for a body lotion which is light and fresh and this Philosophy one is worth investigating! Like you, I really prefer to try products in store. Have a good week, Kim. Thanks for linking my review hun I appreciate it. I have been eying the Too Faced Melted lipsticks for the longest time. I love the colors available. what a glamorous wish list! you have a really good eye for beauty products :) hope you had a great weekend! Cool wishlist. Love the orange chanel nail polish and yves saint Laurent's liquid foundation. great wish list kim! interested in how the yves saint laurent liquid foundation works out for you! and love those nail lacquer colors! so summery! I never heard of Lipstick Queen! Hope you have a good week Kim and manage to pick up some goodies! Looking forward to your review on the products from your wishlist! Nice choice! I have to check out that Schwing eyeliner. I normally use pencil eyeliner but this looks so easy to use! Those nail colors could not be a more perfect summer manni/peddi combo - I will have to try and duplicate! Hi Kim, what a nice wish list you have going on! Everything sure looks nice. Have a nice day. Love the 2 nail polish colors, they are the perfect summer shades! What a great selection, I have my eye on a few items! I wasn´t familiar with the brand Lipstick Queen, but is sounds great! Thanks for the tips! Oh all so lovely picks! That Lipstick Queen lipstick has an awesome name indeed and the shade looks really pretty. I can't believe it's $45 though. The Paul & Joe products look and sound divine! I love their packaging in general. Lip gloss you can taste?! You had me at the Chanel polishes - because really, what's not to love? - but the idea of lip gloss that tastes like ice cream is almost too good to be true. Although I sort of worry I might just wind up eating it...! What a wonderful wish list!! I love the Flowerbomb by Viktor and Rolf!! Hello Kim, I use MAC foundation and I really like it. I also like the Chanel nail polishes, so summery! Love all your picks and no, I haven't heard of Lipstick Queen. Looks like a nice colour though. Have a fantastic day! I'm loving the Chanel nail polishes. The summery colors are so fun and pretty! Great wish list! I'm also interested in the Viktor & Rolf scent, but it's definitely one of those things to try in the store. Thank you for your lovely kind comments. My daughter bought this perfume and just lives it. I really like chanel nail varnishes and love to buy a new one in the airport on the way out. I like the other choices and look forward to the reviews in the future of some or all that you buy. Great wish list! I really want to try a Mac foundation too, and the new too faced melted lipsticks! I really recommend the Mac Pro Longwear concealer if that's the one you were talking about! 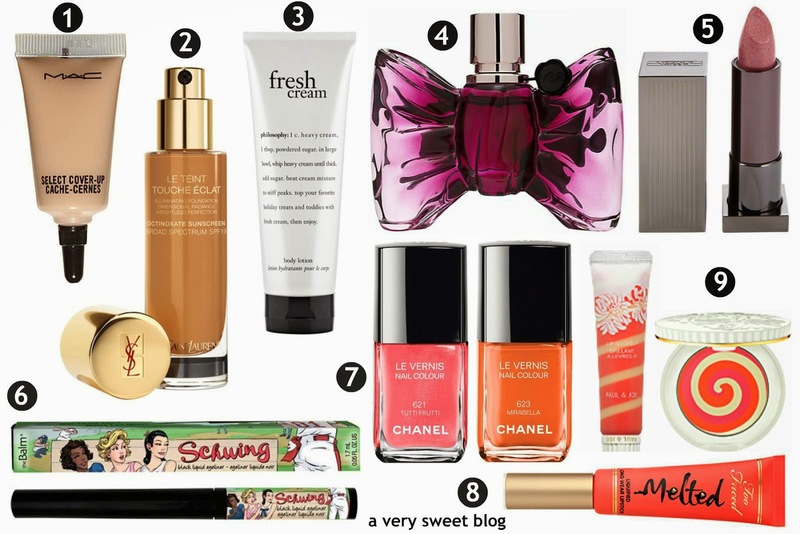 thats a really sweet blog, love the Chanel polishes! You have a great wish list started here. I just love going to Sephora and browsing through everything they have! I would especially like to try the Cream Parlour Collection from Paul & Joe. Anything by Chanel is fine by me! And I have never heard of the Lipstick Queen company before. Let them Eat Cake is a great name. Pretty color too. Oh, my so pretty and sweet wishlist. It makes me want to get something new as well. Hope you will have a chance to get all of these products my lovely and so sweet Kim. Nice beauty wishlist! I like those nail polish colors! I love those shades of nail polish!! My next beauty purchase will be some new blush! I really want to try that eyeliner! Two Faced Melted Lipstick is rather the cutest name ever :)). Your wishlist is pretty cool. Really nice products Thanks for sharing. Your wishlist is amazing! I especially love the Chanel polishes. I love Ysl's foundations, they're so light and suit my sensitive skin. What a nice choice of products! Extra sweet post and so many temptations! I am now eyeing Philosophy's Fresh! You always have the best picks Kim, there isn't anything I don't want from your amazing list! Thanks for your kind visit hun! Ah I have that MAC concealer I like it! And that liquid lipstick does sound interesting, though it must may be the packaging. Great list! I love the sounds of the eyeliner! So many great products! The Chanel nail lacquers are perfect for summer as you mention - I do not have in mind anything to get other than a blush. Last night I dropped mine and it shattered into pieces. I am still upset at myself. Those Chanel nail polishes are everything i want on my nails this summer! I would also highly recommend the YSL Youth Code foundation, it's aaaamazing. wow Kim these are fab wish list and I really don't mind owning them. I have not heard of that lipstick but will def check it out. Amazing, amazing products. I want MAC lipsticks! I want bobbi brown something. I want a good perfume which will be my signature. This post just is lovely. Your list looks awesome. I am so far behind trying new products. Those days are over for moi so let me live through your experiments. Amazing list! I love your blog and I have started following you with Bloglovin and GFC. If you ever get a chance to check out my blog I would be delighted, thanks!